Fleet of foot and lean of meat, rabbits are difficult to hunt and offer little sustenance. Yet research published in Science Advances by Trent University associate professor of Anthropology Dr. Eugene Morin has shown that they were frequently part of the diet of early humans and Neanderthals in the northwestern Mediterranean as far back as 400,000 years ago. Professor Morin and Dr. Jacqueline Meier of the University of North Florida examined rabbit bone assemblages from eight Lower and Middle Palaeolithic sites in present-day France, including Terra Amata, an open air site near Nice where they collected rabbit bone assemblage data. The site is the earliest known location that humans hunted this type of game in Eurasia. Prof. Morin's work challenges the general consensus that small fast game hunting began during the Upper Palaeolithic period, about 40,000 years ago. Their work shows that even during early Palaeolithic times, humans ate a wider variety of meats than the ungulates that accounted for the bulk of their calorie intake. This finding is also significant because it means that Neanderthals were able to expand their diet in contexts of food shortage, a type of behavior that was previously believed to be exclusive to early modern humans. "Large game like horse, bison and red deer made up the majority of the meat diet," says Prof. Morin. "But it's likely that, in the Northwestern Mediterranean region, difficult-to-catch animals like rabbits helped bridge gaps in food procurement in seasons where large animals scattered. This may have helped humans live at higher population densities than would have been possible otherwise, and could allowed more people survive periods of food shortage. Hunting rabbit might have been an efficient strategy to prolong survival, and since rabbits could be hunted by individuals or small groups, rabbit hunts might have involved different degrees of social prestige and cooperation than those that targeted larger animals." 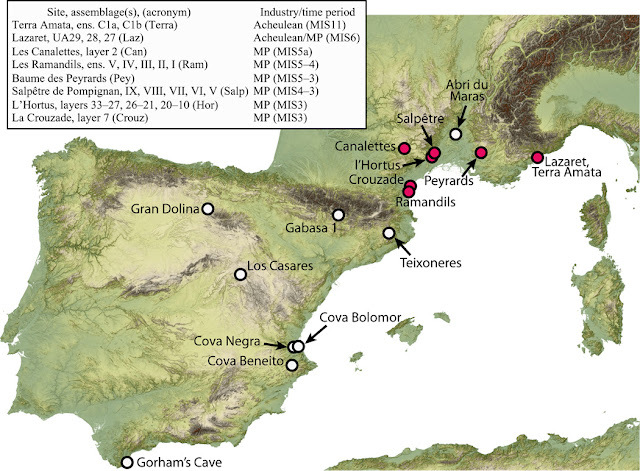 The research also demonstrates that even during early Palaeolithic times, there was geographical differentiation in diets in Europe. Hunters in the northwestern Mediterranean were likely hunting rabbits individually, which may indicate that primitive traps or snares were already in use. The research also raises questions about the significant social implications that hunting smaller game may have had. Very interesting research but it assumes that meat of herbivores was an essential part of the "archaic" diet, which is probably not correct. Different lines of evidence suggest that archaic Homo only occasionally ate meat: comparative anatomical, paleo-environmental, isotopic and nutritional data show that most or all Homo erectus and Neandertals were waterside omnivores, whose diets included shellfish (rich in brain-specific nutrients such as DHA) as well as shallow-aquatic and waterside plants, google e.g. "coastal dispersal 2019 Verhaegen". This is called the littoral theory, or the coastal dispersal model (Munro 2010 "Molluscs as ecological indicators in palaeoanthropological contexts" PhD thesis Austr.Nat.Univ. Canberra). Coastal fossilization is very difficult, due to waves, tides, tsunamis, plate tectonics and Pleistocene sea-level changes (Fischer 2011 "Stone Age on the continental shelf: an eroding resource" in Benjamin cs eds "Submerged Prehistory" Oxbow). Note also that tools and fossils (stones and bones) preserve much better than plants, wood, broken shell and fish remains.